To be successful in driving engagement from business buyers, it’s not enough that marketing content simply be relevant to the individual reader. To be information of value, that same content needs to be useful, and at a very fundamental level it needs to tell the reader something he or she doesn’t already know. Sounds obvious, right? And yet if I were to choose the one thing that dooms more B2B email creative to mediocrity and worse, it would be just that: telling people stuff they already know. In 90 percent of all cases, this dreadful habit occurs in the service of what at our firm we call the “set-up paragraph” – that very first paragraph of email copy in which the writer attempts to make a case for why the recipient should care about everything else he/she is about to read. Set-up paragraphs can be a necessary evil if the information on offer is purporting to describe a solution to a problem the reader may not know he has, or an opportunity he may not know exists. And even then, they should be as short as possible. Most of the time, however, set-up paragraphs simply bog down the email in a recitation of facts (e.g. “As a busy IT leader you know …”) that does nothing but try the reader’s patience. For a particularly egregious example, see the email below from Azalead, a software platform for Account-Based Marketing (ABM). Starting with the headline: “Your buyer has changed more than any time in history (sic),” almost 70 percent of the entire email is given up to making a business case for why I should care about ABM. Now, if you need to convince any B2B marketer at this point that ABM is a trend worth noting, he or she is probably beyond help anyway. But even if I were to be somehow completely ignorant of this thing called ABM, that entire first paragraph is nothing more than a lecture. No offer, no value proposition, no call to action, nothing that tells me what the writer wants me to do, and why, and how. The one and only call to action is at the very end of the email, and by then, assuming I’ve read that far, I know absolutely nothing about the actual offer (a mysterious “free guide”) aside from the 3 very anemic bullet points that attempt to describe the value of the information in such lackluster terms as “What exactly is Account-Based Marketing (ABM)”. There’s no benefit language, nothing that describes in a specific, concrete or compelling way how this free guide will benefit me or my business. Key takeaways: Don’t tell me stuff I already know. Don’t lecture me on a business trend or challenge or problem that you think I should care about. Get to the point. Tell me WHAT the offer is, WHY I want it, and HOW to get it. And then deliver specific, compelling examples of what I’ll learn when I do respond. 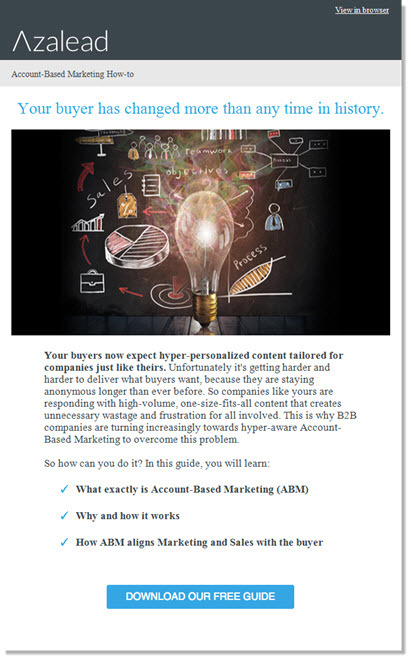 Of course there’s also a further irony to Azalead’s message, namely that their pitch begins with “Your buyers now expect hyper-personalized content tailored for companies just like theirs.” Everything, in other words, that this email is not. 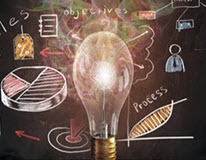 This entry was posted in Account-Based Marketing, B2B Marketing, Campaign Strategy, Content marketing, Demand Generation, email marketing, lead generation, Uncategorized and tagged Azalead, B2B email creative, B2B email marketing, b2b email marketing agency, B2B email marketing best practices, B2B email strategy, B2B Marketing, email best practices, email marketing, email marketing best practices, email marketing tips on March 22, 2017 by Howard Sewell.